Aside from a change of setting, this is a faithful adaption of the source book. Yes, moving it from Vermont to England will leave viewers a little surprised, especially if they've grown up watching the 1960s Disney version. But accents aside, this is the more authentic version and if you loved the book, you'll love this film. For those who don't already know, Pollyanna is a poor but cheerful girl who, after becoming orphaned, is sent to live with her very rich, and very strait-laced aunt Polly. The two have very different ways of viewing the world, with the joyful Pollyanna seeing nothing but wonder, despite the losses she's faced, and aunt Polly seeing nothing but the problems, despite the riches that surround her. So whose worldview is going to win out? Is Pollyanna going to stop giving out hugs, or is her aunt Polly going to get over her reluctance to be touched? Something has to give! As Pollyanna gets to know the people in her new community, both young and old, she teaches her game to them, and in doing so, transforms her community - they too, start to see the silver lining to each dark cloud. But what about aunt Polly? What is she going to think about the game? It's worth noting that the "glad game" can be taken to extremes. For an example, in the book, when an older man breaks a leg, Pollyanna notes he could be glad that he broke just the one leg. Well, okay. But, as the Preacher said, there is a time for everything, and that includes mourning. So maybe it is fine for the man to just simply be sad for a time at the pain and suffering that's happened to him. That said, I don't think many of us are in danger of overdoing our gladness, so couldn't we all do with a good dose of this Pollyanna-ish thinking? 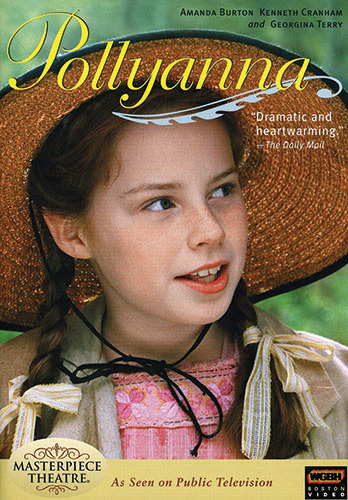 The only other caution concerns one shocking/sad moment that will cause young viewers distress – near the end of the film Pollyanna gets seriously injured. It all happens in a flash, so nothing gory is shown, but our girls needed to be reassured that Pollyanna would recover. I am fan of movies and love to watch movies. I had watched all kind of movies but one of my favorite genre is fiction and action. I also love to watch animation movies. But I haven't heard about this movie. Thanks for the review and trailer. I will watch online this movie if i found that online.